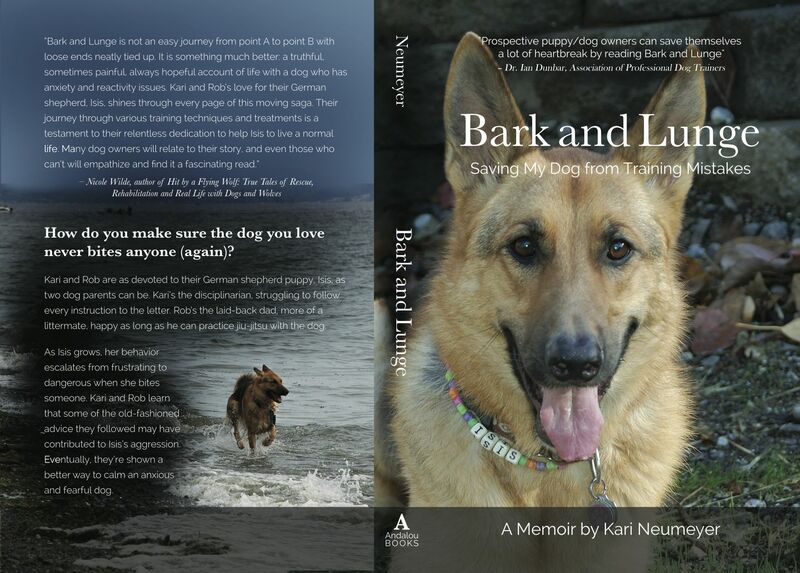 I’ve been uncharacteristically wordless lately because I’m gearing up for the launch of Bark and Lunge: Saving My Dog from Training Mistakes. Add it to your Goodreads list now, and on July 29, buy the print or eBook (or both!) from any of your usual online booksellers. I’m SO excited for you! What a beautiful cover – front and back! Good luck with your book launch. Love the cover!!!! Bookmarking this page! Would love to add to the list! http://talenthounds.ca/news/top-dog-books/ Great to cross promote + looks like a great read! I would love that too. I’ll send you the links to buy when they’re up. Thanks! Congrats, congrats, Kari! Cannot wait to read. And the cover is lovely. P.S. Can I interview you for my blog? Congratulations! The cover is just beautiful! Gorgeous!! Well done and huge congratulations! Wishing you lots of good luck with it! 🙂 The cover looks fantastic! You must be so excited!! I just wanted to tell you that I’m really enjoying the book so far!! Looks great, Kari! Will you be reading at VB or?